Midyat, Turkey (AINA) -- The Turkish court issued two decisions today in the case of the embattled Assyrian monastery St. Gabriel and postponed until September 30 another decision. The dispute is over the so-called forest, land that lies within the monastery grounds and which is comprised of half grown bush. Click here for complete coverage of the St. Gabriel Monastery case. 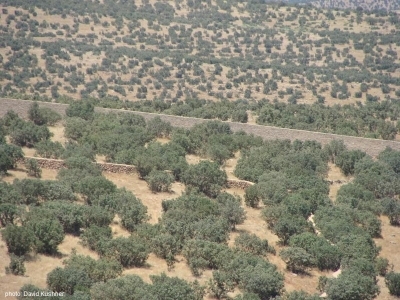 According to today's court decision this land is now owned by the Forestry Department (a Turkish authority). The monastery lost some 34 hectares of land (136 acres). The court decided that the Forestry Department, on behalf of the Turkish State Government, now owns the land and can do whatever it wants with it. Despite the fact that the protective wall that shields the monastery staff and its guests lies on that land. The great surprise for the most of the international representatives was that the Turkish state involved itself in such a "minor" matter that is vital for a religious community and affects a historic monument. The case against the director of the monastery foundation, Mr Kuryakos Ergün, was held in another court room; he was charged with intentionally violating the law by building the protective wall that surrounds the grounds of the monastery. This case has been postponed to 30th September. The Turkish State Treasury Authority lost its other case against the monastery. Twelve parcels of land both inside and outside the wall of the monastery, amounting to some 24 hectares of land (96 acres) remain in the possession of the monastery, though the board of the monastery believes this decision will be appealed. The Monastery of St. Gabriel was founded in 397 A.D. and is a great and historically important Christian symbol in the middle of Turkey; it is for the Syriac-orthodox faith what St. Peter's in Rome is for the Catholics. The Turkish state and three village leaders are trying to expropriate land that is legally are owned by the monastery. International interest in the case is so great that the local court authorities had to refurnish the court rooms. As in the previous trials politicians, diplomats and NGO:s where present from the entire European Union. The local and national press of Turkey were also there in force. Rudi Sümer, one of the monastery's lawyers, said "we will appeal to Ankara and if we wont win there we will go to the European Court."